A new lignocellulosic-Al2O3 hybrid biosorbent (LC-Al2O3) was synthesized using wood residue material from the oak tree (Quercus robur). Biosorbent was tested for the simultaneous removal of three different types of pollutants: cationic (copper (II) ions), anionic (textile dye Reactive Blue 19) and nonpolar (fungicide cyprodinil) in the multi-component model solution and natural water. Biosorbent characterization was performed by Fourier transform infrared spectroscopy, scanning electron microscopy with energy-dispersive X-ray spectroscopy (SEM–EDX) and X-ray diffraction analysis. In order to define optimal process parameters for simultaneous removal of all three pollutants, effects of pH, temperature, sorbent dose, pollutants concentration and hydrodynamic conditions on the sorption process were investigated. Sorption of pollutants onto LC-Al2O3 was highly pH-dependent and the optimal pH is 5, with removal efficiency near 98% for all three pollutants. Sorption kinetics followed pseudo-second-order, intraparticle diffusion and Chrastil’s models, which suggest that both surface reaction and diffusion were rate-limiting steps. Equilibrium experimental results are the best fitted by the Langmuir sorption isotherm model. The maximal sorption capacities of the biosorbent for simultaneous removal of pollutants in multi-component system are 15.69 mg g−1 for copper (II), 29.99 mg g−1 for Reactive Blue 19 and 20.97 mg g−1 for cyprodinil. 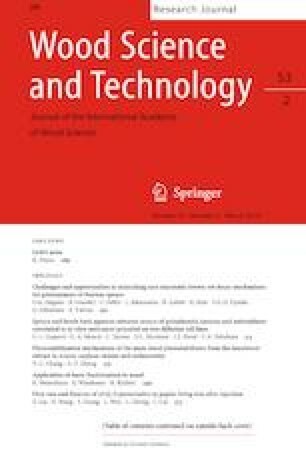 The present study shows that using wood residue material to produce a low-cost sorbent can reduce wood waste and increase reuse/recycling options, and also effectively decrease the water pollution simultaneously removing heavy metal ion, textile dye and pesticide from aqueous model solution and contaminated river water. The online version of this article ( https://doi.org/10.1007/s00226-019-01093-0) contains supplementary material, which is available to authorized users. This work was financed by the Serbian Ministry of Education, Science and Technological Development through the Grant No TR34008.